John Foster ran a great tournament in Belfast yesterday and a bunch of us from the Dublin area travelled up for it. I used the lists I posted last week, but had mixed success with them. The format was a four round 25pt tournament with a second list being optional. It was a really fun day and here’s a breakdown of the four games. 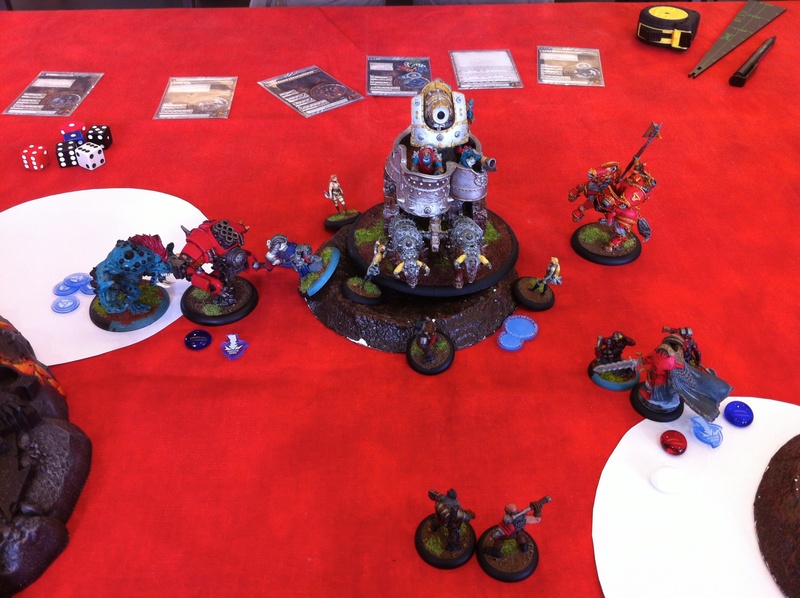 In game one I faced Mike Marchal and his Makeda2/Molik Karn bullet list. I played poorly in this game and it started with the wrong choice of ‘caster. I went with my Karchev list, but presented a juicy target after I over extended to drop some Destroyer bombard shots onto Makeda2. 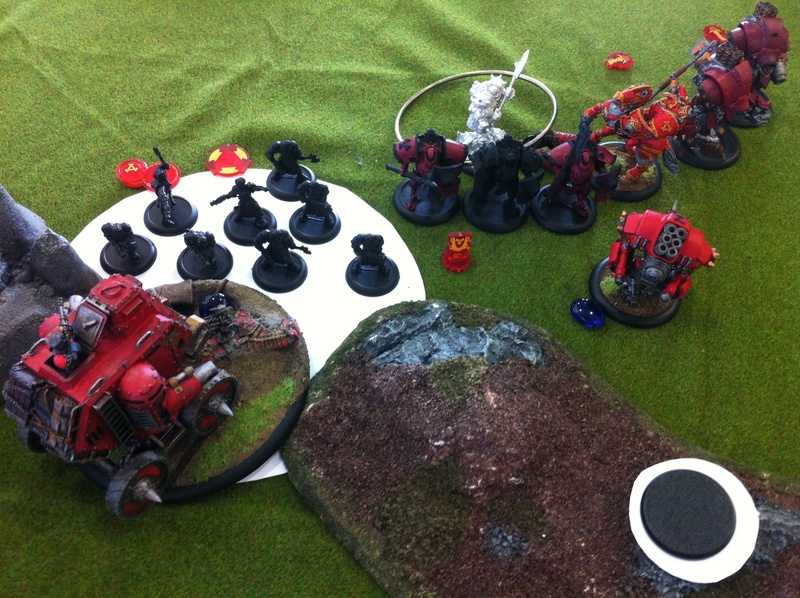 Mike seized the opportunity and put Karchev down (needing all five of his Fury on top of the initial attacks!). Mike was a fun opponent, but I hate the Molik bullet. It is decidedly unfun. Oh, the scenario was Incursion, not that it mattered. In this game two battle engines faced off against each other. I played Stuart and his Madrak2 list. This time I used my Vlad2 list (vowing not to take Karchev out of the case for the remainder of the day!). This game went a lot better, but my dice luck was terrible. This contrasted quite badly with Stu’s very good dice. The scenario was Close Quarters and again it didn’t come into play. The key moments were when three Blood Furied Pygmy Burrowers destroyed an undamaged Gun Carriage (as revenge for it killing three of their comrades on turn 1) and when three Kayazy Eliminators and the Drakhun, under Vlad’s feat couldn’t take down the War Wagon (I rolled snake eyes on two Elimiator attacks), leaving it on 1 damage! The War Wagon blasted a Mechanik near Vlad, knocking my warcaster down. He was finished off by the Pygmys. I rarely feel like my dice beat me, but in this instance they played a major part! Stu was a great opponent as always and he went on to win the tournament. 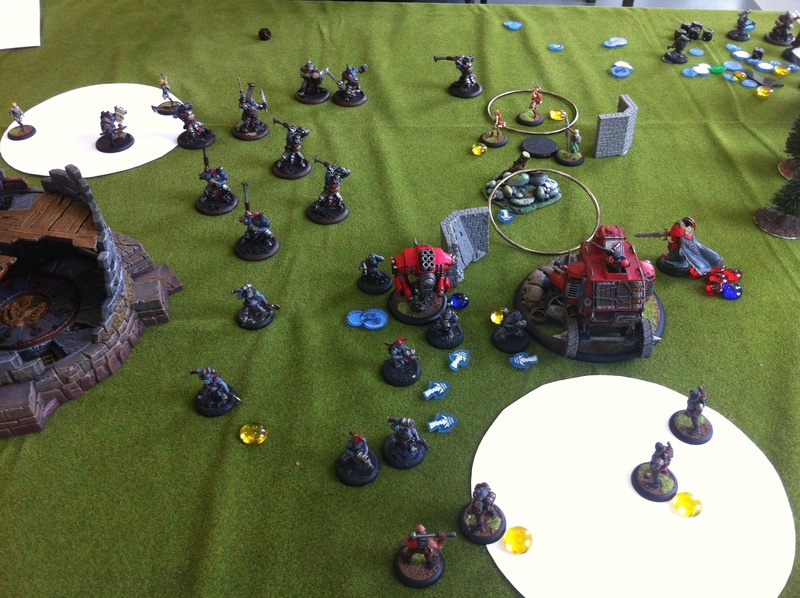 My fortunes changed in Game 3 when I faced Niall’s Khador. He used Butcher1 (proxied using Butcher2 model) and I stuck with the Vlad2 list. The Gun Carriage really shone in this game, dropping AoEs onto Winterguard as they advanced and then dropping the Butcher to only four boxes with some insane (Hand of Fate assisted) damage rolls. The Drakhun (under Vlad’s feat) charged in to seal the deal. I felt a little bad for Niall (who is also an eVlad player) as the game was over at the top of turn three. One of my favourite moments was seeing the Marauder (with Assail) slam the Juggernaut into the Destroyer to open up the charge lane for the Drakhun. It was a fun game with very low attrition on both sides. The scenario was Demolition and I managed to grab two vital CPs too. Anthony and I play a lot of games and it’s not that long since I faced a 35pt variant of the Madrak2 list he fielded here. That time I used MAcBain and assassinated him with Elimiators, but this time around my only focus was on the scenario, which was Diversion. With the Kayazy Elimiators I had a strong way to contest that far zone and control the flag. I won the starting roll and opted to go second as I wanted to have the first chance to score. And that is exactly what happened. Kayazy’s that can run 20″ on Vlad’s feat are an amazing thing. 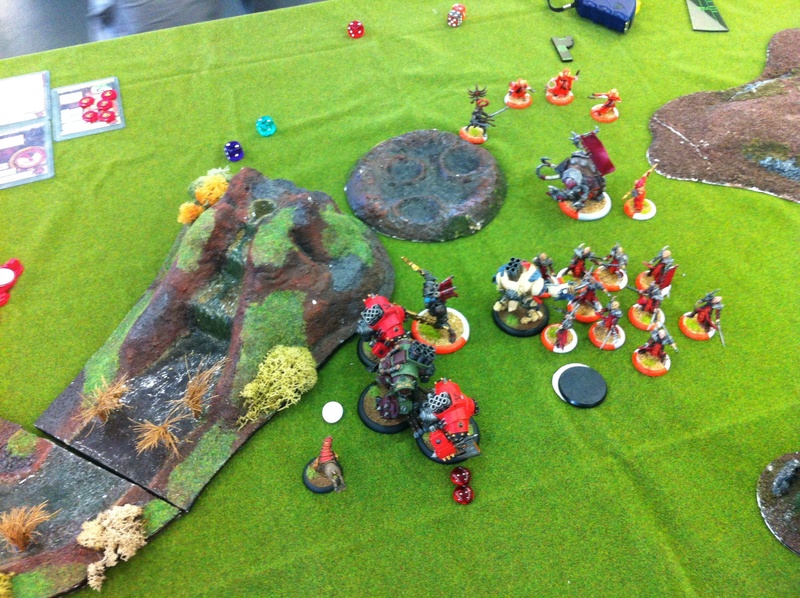 The other unit cleared out the Fennblades around the flag and Wyshnalyrr (who is great with Vlad) grabbed the flag. Anthony began scoring on the next turn and this became a very tense game. Again it looked like my dice had let me down when I failed to kill the last Burrower contesting my zone, but as Anthony couldn’t quite manage to finish off Vlad the CPs swung in my favour and I won the game 4-3. Again the Gun Carriage was awesome. I was amazed to get 4th place after such a terrible start. I also picked up a painting prize (randomly award; you just needed a fully painted army). Well done to all who took part. It was a fun day’s gaming. Looks like a fun day. Kiel was good too, I ended up tenth which is better than before. Mulg ruined my day twice! Mulg is awesome and a pain in the arse! Glad you had fun. The way I’ve been building eMadrak, I’ve been having real problems with high Def. Strongly considering Min Longriders + Horthol as a counter – Cavalry Charge + Fell Caller is MAT 11, and boosted to hit on impact attacks. Probably going to start tooling up the Grim list as a second for mass high def lists – War Wagon, Scattergunners, Feat + Marked for Death.